Beautifully-finished double upstairs maisonette covering 74 sq. m. on the second and third floors in the popular Rivierenbuurt neighbourhood. 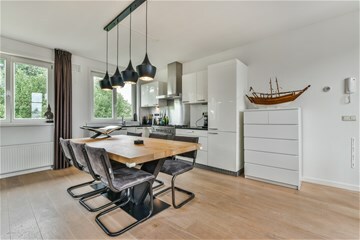 The apartment has an attractive, unobstructed view of Martin Luther Kingpark and is situated close to the Amstel. The kitchen and living room are located on the third, uppermost floor leading onto a roof terrace of 21 sq. m., which is a great place to enjoy the sunshine. 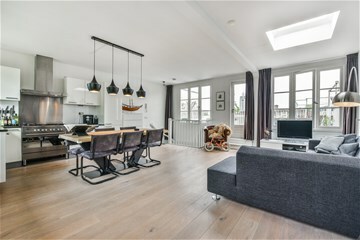 Overview of layout: Access to the property is via a well-maintained staircase and the maisonette’s private first-floor entrance and staircase to the second floor. The spacious foyer provides access to all rooms. The master bedroom is at the rear and has French doors that open onto the balcony. The bedroom features luxury, professionally-fitted wardrobes. A cupboard on the balcony houses the central heating boiler (Remeha, 2008). The deluxe bathroom has a double sink, walk-in shower and bath. The washing machine and dryer connections are also located here. Separate toilet with wash basin. The second bedroom to the rear of the property also provides access to the balcony. This bedroom also features a deluxe professionally-fitted wardrobe. Third floor: Very light and airy living room with open kitchen, complete with six-burner gas hob, wide oven, dishwasher and fridge/freezer. This is a lovely room thanks to the numerous windows and unobstructed view at the front. 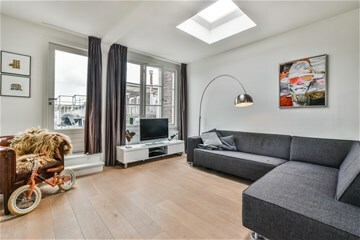 From the living room, you have access to the sunny roof terrace (over 21 sq. m.) to the rear. The entire home is fitted with beautiful oakwood flooring and well-finished walls and ceilings. 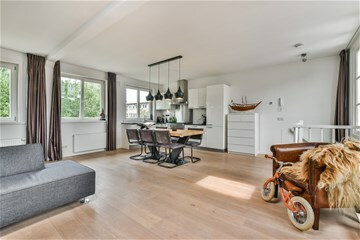 The property enjoys a perfect location in the popular Rivierenbuurt neighbourhood, close to Martin Luther Kingpark, the Amstel and Rijnstraat. Rijnstraat offers a large and varied range of shops. De Pijp neighbourhood is within cycling distance and features the distinctive Albert Cuyp market, Van Woustraat and Ceintuurbaan. A few minutes’ cycling will also bring you to fashionable Maasstraat. The property has great road connections: the A1, A2 and A10 motorways are only minutes away. The Amstel and RAI railway stations are within walking distance. 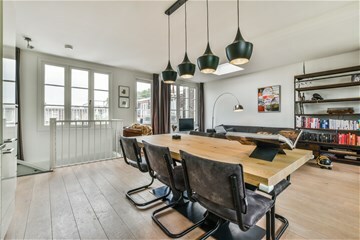 A tennis club, several rowing clubs, cosy restaurants and a great jogging route along the Amstel are all just a short walk from the apartment. Unusually for Amsterdam, you can almost always find a parking space right in front of the door. 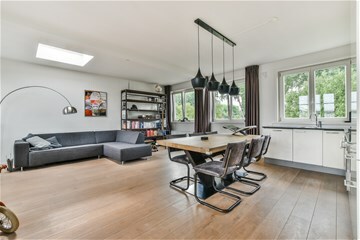 At a glance: - The property has an attractive, unobstructed view over Martin Luther Kingpark and is situated close to the Amstel; - The annual ground rent is €796.80. The ground rent is indexed annually and the lease currently runs until 15 January 2059; - Wooden window frames throughout and double glazing at the front (HR++); - Spacious terrace of more than 21 sq. m. off the living room; - Double upstairs maisonette on the second and third floors, no upstairs neighbours and private entrance from the first floor; - The property features well-finished walls and ceilings; - Active and financially-healthy home owners’ association. The monthly home owners’ association service fee is €110. 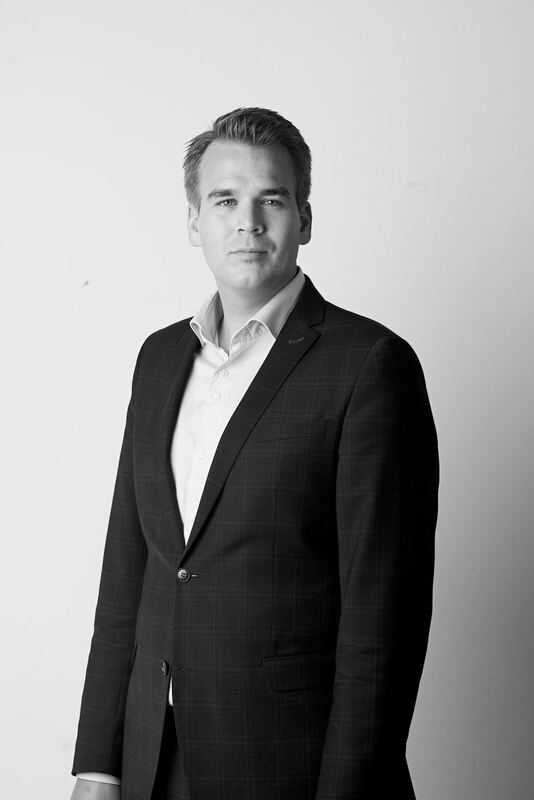 The home owners’ association has three members and is self-managed.